CEDAR FALLS — Robert Dean Berry, 85, of Cedar Falls, died Friday, Feb. 12, at Covenant Medical Center, Waterloo. He was born April 7, 1924, in North English, son of Paul E. and Maud Evelyn Blumenstein Berry. 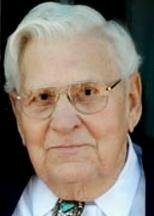 He married Jean M. Wichersham on Dec. 28, 1949, at First United Methodist Church, Cedar Falls. Mr. Berry served in the U.S Navy during World War II. He was a plant manager and dispatcher for Benton’s Ready-Mix for 25 years, retiring in 1984. Survived by: his wife; a son, Paul (Lori) of Janesville; a daughter, Susan (Rob) Gerken of Cedar Falls; four grandchildren; six great-grandchildren; and a brother, Bill (Lois) of Williamsburg. Preceded in death by: two brothers, Paul Jr. and David. Services: 2 p.m. Tuesday at First Presbyterian Church, Cedar Falls. Public visitation from 4 to 7 p.m. Monday at Richardson Funeral Home, Cedar Falls, and for an hour before services Tuesday at the church. Memorials: may be directed to the Soles for Souls at the church .